As the dew of Hermon, and as the dew that descended upon the mountains of Zion; for there the Lord commanded the blessing; even life, for evermore. Below are links for the Masonic Educational Program for Candidates, assembled in 2001, by Andrew Horn, Head Candidate's Coach for Santa Monica-Palisades Lodge #307. The Holy Saints John; To Whom All Lodges Are Dedicated. The Tenets; Brotherly Love, Relief, and Truth. Masonry and Citizenship; The Charge. Symbols of the Entered Apprentice. 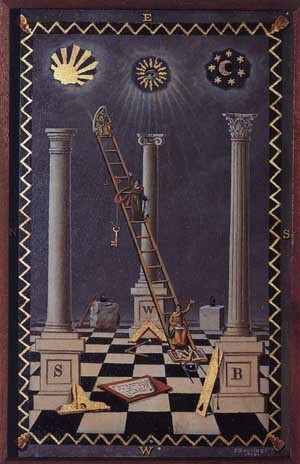 Masonry and The Sacred Law; The Holy Writings. The materials contained in this program are selected from the Grand Lodge of California's Candidate Education programs, therefore all content should "technically" be endorsed by the Grand Lodge as approved educational material. The images used on this page and the accompanying EA, FC, and MM pages have graphics taken from the amazing and beautiful book "Freemasonry; A Journey Through Ritual and Symbol", by W. Kirk MacNulty. I am under the impression that the artwork itself is long past copyright status, but this striking book is a great price at only about $15, and is packed with thoughtful interpretation of our Ritual. I highly recommend it. It is available through the Southern California Research Lodge, or through Amazon.com.